Follow RT to get news and updates on the US-backed coup in Venezuela, which took place in January 2019. As President of Venezuela Nicolas Maduro took the oath after being re-elected a second term, the US Secretary of State Mike Pence called his regiment ‘illegitimate’ and promised to help ‘restore a real democracy’ in Venezuela. The opposition leader Juan Guaido was quick to show readiness to proclaim himself ‘interim president’ during a massive rally in Venezuela’s capital, Caracas. 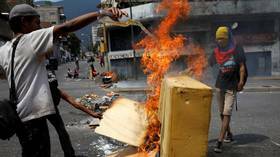 On January 23, Venezuela was taken over by nationwide protests, and Guaido fulfilled his plan. Shortly afterwards, the President Donald Trump issued a statement of support for the self-proclaimed governor, encouraging ‘other Western hemisphere states’ to follow the lead of the United States. Canada, Brazil, Argentina, Chile and some other countries recognized Guaido as Venezuela’s president. However, Mexico did not support Guaido, and Cuba called the move an ‘attempted coup.’ Find news and updates on the situation in Venezuela on RT, and don’t miss photos, videos and live feeds from the country and its capital Caracas. Visit RT for experts’ and analysts’ opinions on the US-backed coup in Venezuela. 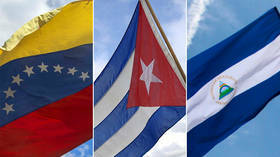 The US is ready to use all means to remove the unwanted socialist governments of Venezuela, Nicaragua, and Cuba from power in order to achieve full control over Latin America, Russian GRU chief Igor Kostyukov has warned. The Trump administration claims that its increasingly punitive sanctions on Venezuela “do not target the innocent people” but the government of President Nicolas Maduro. A new report on the effects of sanctions debunks that myth. 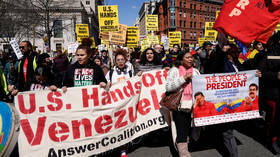 Activists occupying the Venezuelan embassy in Washington in solidarity with President Nicolas Maduro's government are bracing for confrontation as authorities prepare to try to seize the building on behalf of the opposition. Responding to the State Department “applauding” countries that sided with Washington’s regime-change efforts in Venezuela, the Russian Foreign Ministry said clapping is at least harmless and keeps the trigger-happy US hands busy.